Hos Dorte: I for Inspirational Photo, DT card for ABC Christmas Challenge. 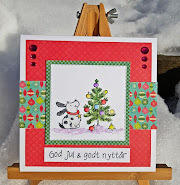 I for Inspirational Photo, DT card for ABC Christmas Challenge. Hi crafters, and happy May. ABC Christmas Challenge is ready with a new challenge. I is for Inspirational Photo. 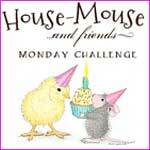 I have used a sponsor image for my card, it's called 'Ornament Mouse'. Ribbon, pearls and ornament charm are from my stash. A circle at the back side and my personal stamp. I LOVe your card and the way you used the inspiration! aahhhhhhhhhh this is a cute one Dorte great and gorgeous card. This is so cute! Great use of all those circles and ornaments! Love your papers and your soft color scheme. Thanks for playing with CSAYL. OMG - that mouse is just adorable and you have coloured him beautifully. I love the layout of your card too, and the bauble theme. What fun with all the circles to match the ornament! Thanks for joining us at CSAYL! Sweet card, love the ornament charm!